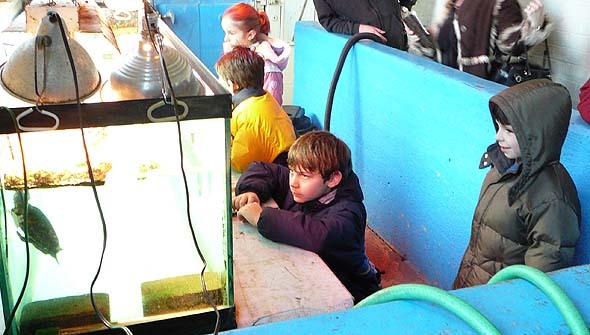 Young FOBIA members learning how to care for turtles in the Aquarium basement. Apologies for the long delay in bringing you up-to-date. We've had ever-increasing problems getting news into circulation using our old listserv. This process was subject to constant spammer attacks and has now been closed. Instead, we've opted for this newer method which allows us to offer you a more extensive newsletter, bringing you up-to-date in a timely manner. Over the last year FOBIA has taken great pains to convert the organization from a confrontational approach to a stance of pro-active cooperation in order to create ties with the Detroit City Administration. Put simply, we want the City Administration to toss us the keys to the Aquarium, and we believe this approach is starting to pay off. On a State level, we are approaching Senators, members of the House and Commissioners. This is a bipartisan issue. Opening the Belle Isle Aquarium is an outcome which both sides of the aisle can feel good about. There has been significant progress in talks between FOBIA executives and City Administration officials. We will be submitting our business plan to them in our upcoming meeting. We are delighted to announce that the Detroit Executive Service Corps has generously offered to assist us with our business plan. If you can't donate your time, but you want to want to contribute, go here.